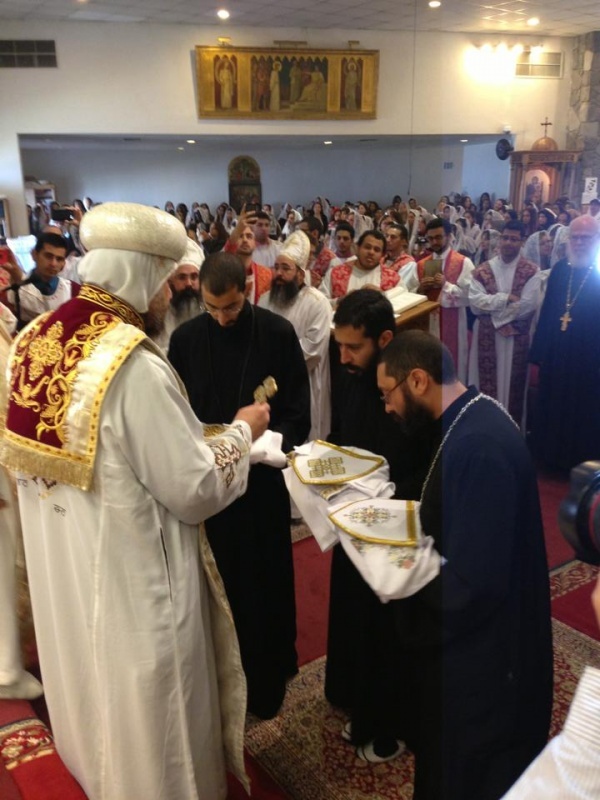 On Sunday, November 10, 2013, Their Graces Bishop Serapion and Bishop Youssef laid hands on, and ordained, three new presbyters at St. Maurice Church in Pomona to serve in this Christ-loving Diocese. Deacon Pimen Shenouda was ordained as Father Pimen Shenouda to begin his service at St. Paul and St. Marina Churches, respectively. Deacon Theophilus Paul and Deacon Antony Paul were ordained as Father Arsani Paul and Father Antony Paul, respectively, as celibate priests for service in the St. Paul Brotherhood, which is a celibate monastic community existing in the world and serving the Diocese. The ordinations were attended by many clergy from around the Diocese and a host of parishioners from several churches. The Very Reverend Father Nicholas Letten of the Church of the Annunciation (Orthodox Church of America) also attended as an esteemed guest to witness the ordinations. All of the new presbyters will travel, God willing, to the Monastery of Abba Pishoy in Wadi El Natroun to spend their forty days in contemplation and prayer, preparing for their service. The Diocese rejoices in her new servants and prays that they will be filled with grace and the fruit of the Holy Spirit.